Sh ape magazine's October 2012 issue featured a collection of trendy brands that help promote breast cancer awareness and fund research. Included was OPI, with its Pink of Hearts nail lacquer duo. OPI will donate $25,000 to Susan G. Komen for the Cure. 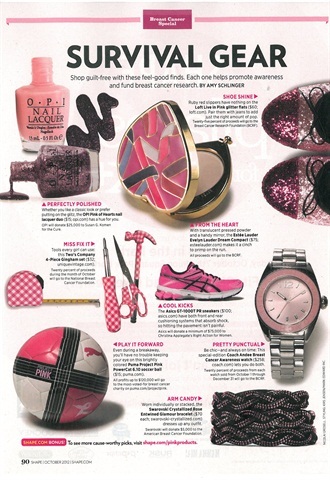 Additionally, OPI's polish You Glitter Be Good to Me was featured in Self magazine's breast cancer awareness spread and was one of ten breast cancer awareness beauty products listed in Teen Vogue's October issue.